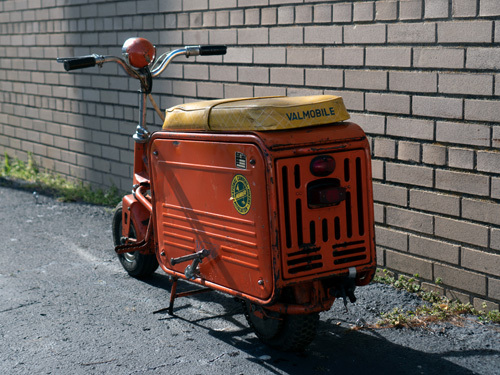 Production of the Valmobile “suitcase scooter” by the Hirano Motorcycle Company of Japan began in 1956, after the previous manufacturer Martin-Moulet struggled to find success for the Valmobile in its native France. 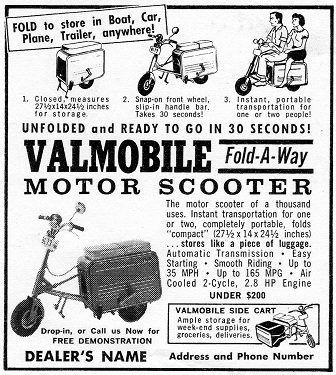 In the mid-1950s to the early 1960s, Japan and the United States were going through a bit of scooter-mania, and Hirano used clever marketing and a healthy dealer network to increase sales of the Valmobile. The Hirano-built Valmobile was powered by a 50cc, two-stroke engine, and used a single-speed transmission operated by a centrifugal clutch, making it perfect for beginning riders. Unfolding the Valmobile involved lifting up the seat, taking out the handlebars, cross-member, and front wheel, and putting it all together without tools. Advertising claimed that the process only took 30 seconds (perhaps after some practice rounds). Folded, it weighs about 75 lbs. Several options were available, including two-person seats, saddle bags, a converter sprocket for hill climbing, and even a fold-away side car. 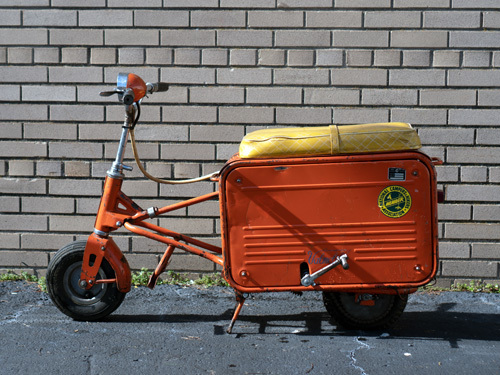 Hirano sold nearly 100,000 Valmobile scooters until production finally ceased in 1961.